This series highlights members of our awesome team, the work they do, and how they do it! I got into UX and Product Design by accident, being mostly self-taught in the beginning. One of my first jobs was doing user research and testing for educational games. From there I started to do a lot of design work myself as it became an area that I really enjoyed working on. I quickly learned how to code, too, making websites and becoming more deeply involved in the products I was designing. Before joining Hugo I was on the Google Apps team. 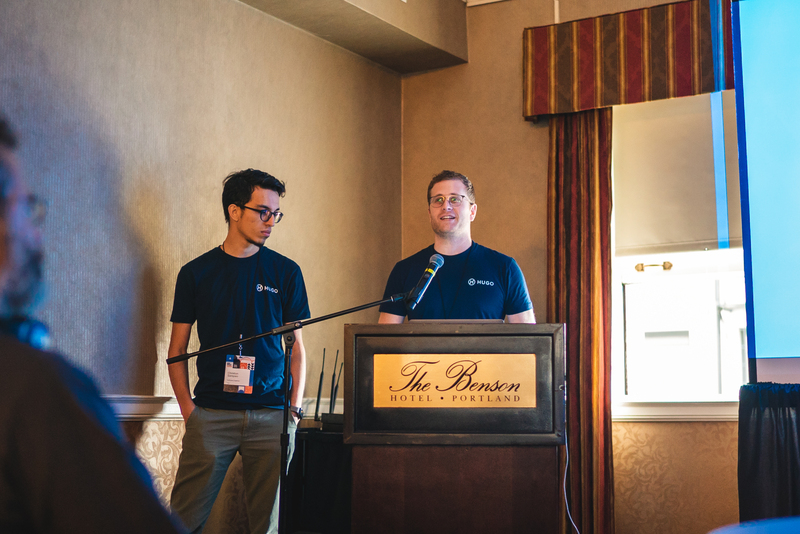 They helped build and support the developer platform and tools that enable third party companies to build apps that integrate directly with the rest of the Google Apps suite - Gmail, Sheets, Docs etc. Working at Google was a great opportunity to learn and grow as a designer. There are a ton of really good, really experienced designers there and I made an effort to absorb as much as I could from them. The design (and development) process is very rigorous and pushes you to always deliver your best. Why did you jump into the startup life? Well, at Google, in addition to it being a very large company, there is a very risk-averse and academic culture. There are pros to this, but the cons are that work moves very slowly and much of what you do never reach the hands of actual users. Startups are on the opposite end of this spectrum, I find this super interesting as a designer. At a startup, you’re more free to try things and take risks - it's a great way to learn organically from the world. You get to see how people respond to your work and iterate based on feedback from real users. At Hugo we have a small amount of resources and work in much shorter timeframes than somewhere like Google. We’re working on a “live” product and need to be able to respond to and solve problems as quickly as possible. These constraints, in addition to feeling very close to our users, results in a lot of creativity and a development process that is very organic. What guides your approach to design? There are two sides to product development - the big idea and the implementation. Big ideas are rare. Those come from deeply understanding a problem and the people you’re solving it for. Sometimes they appear in a flash, other times you have to grind them out. The task of giving those ideas shape and bringing them to users for me is about exploring all of the potential alternatives. Sometimes you think a design is great and then users hate it, and then there are the ones you think are stupid but end up making a lot of sense to people. It’s hard to identify what the best design is yourself. I’ve found it’s important to work through a number of different options, get them into users' hands, and let the world answer that question for you. And as much as I believe in grinding, often ideas just come to you on their own - when I’m out for a run, sleeping, even sitting on the bus. You never know. It’s important that you keep yourself open to these, as they’re often the best. What makes it hard to stick to that philosophy in a startup? Time and speed for sure. The default situation for us is always solving problems in real-time which makes it hard to explore ideas before committing to them. We often follow a cadence of “design, build, re-build” versus a “design, re-design, build” process that having more time could afford. Something else unique to startup design is that the speed at which we move means that we introduce new paradigms more frequently. We often find ourselves having to revisit past decisions because we’ve introduced new features or concepts that the original design wasn’t prepared to accommodate. Tell us about how using Hugo, at Hugo, has impacted your design process? It's really helpful to stay clued into customer conversations without the cost of always being there, because the product keeps us connected while we're working on our daily tasks. I immediately know what the insights are and what users are saying - which is very powerful. If I was dependent on our sales or customer success teams to come back to the office and recall all the thoughts that might be important for the product, we would waste critical time and probably lose half the information. Whereas with Hugo, I can access that information faster and more directly. I can act on their insights without waiting for everyone to get back to the office, particularly in cases when there are remote meetings. Often I prepare solutions to something someone else heard in a meeting that day - it really speeds up the tempo for us and impresses users. Often I can prepare solutions to something someone heard in a meeting that day - it really speeds up the tempo for us and impresses users. Using Hugo has helped us to increase the speed at which we can respond to issues, requests, and ideas that our team hears in the field - along with all the contextual information we need to craft an effective solution. It’s a funny feedback loop - the more we improve Hugo, the more we can use Hugo in our daily workflow… to improve Hugo. At the end of the day, we’ve built a tool that makes us better at our jobs. Our team follows an agile methodology; the faster we can get feedback from the world, the faster we can iterate and improve our product. To that end, Hugo has become a cornerstone of how our team works.